Hi friends, I am so thrilled to be able to share with everyone the arrival of our latest Organic GOTS Certified play mats – The Village Play Mat. This beautiful Village design was made to find its very own home in your home and to serve not only as a Play Mat and Floor Rug but also as a little heirloom piece, something to be loved and treasured and to encourage physical development and the joy of exploration and play in its most pure and simple form. When creating this piece – as with all pieces in the Babee and Me collection functionality, wonderment and style were an integral part of the design process and so The Village Play Mat was brought to life in both colour and monochrome. The coloured Play Mat is a perfect balance of earthy and rich blues, browns, greens and grey to complement its bold and busy outlining, encouraging active play or to simply be a feature piece amongst your nursery. 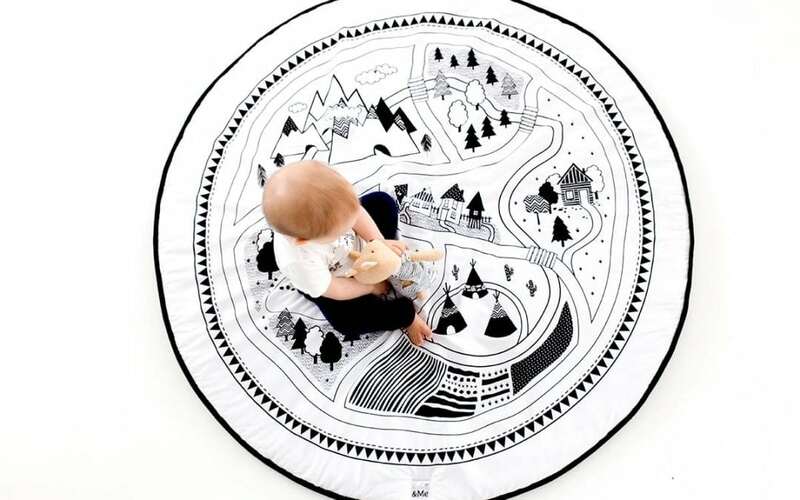 The Monochrome Play Mat was created to suit any decor and its clean black and white design to inspire imagination and wonder. A baby play mat is probably one of the most versatile and highly used items your child will have, especially in their early years of development and play. Little learners need stimulation and playtime to help grow their ever expanding bodies and minds, and the baby play mat serves as the perfect combination of both educational and sensory stimulation which also comforts and entertains. Visually The Village Play Mat was made to specifically be high contrast to support and grow your babe’s visual awareness skills, this is because early on infants prefer high contrast objects simply being easier to see and enjoy in the early years. Gross motor skills are gently encouraged initially laying on their back and then to tummy time, later motivating a baby to roll, use their legs, crawl, reach, sit and eventually play, all of this reinforces your little ones physical development strengthening their neck, back, arms and legs. As families increasingly juggle more and more demands on their time, play mats also serve as a simple and portable item that can be taken on visits, outings and holidays. Both durability and washability were key considerations in its design as well as making a play mat that was quite generous in size and larger than most of the other mats on the market with a 120 cm (47″) diameter size. As with all of our pieces it was vital that these mats be ethically made, using GOTS certified organic fabrics which resulted in a really lovely pairing of soft organic cotton sateen top, organic cotton binding edge and super thick and durable organic canvas as the base fabric. In addition the Village Play Mat has a OekoTex certified (free from chemicals) polyester super thick inner layer which is quilted onto the base fabric layer. This is super plush and the quilting makes it reversible/double sided for a different look. I genuinely hope that you love these mats as much as I did dreaming of and later crafting them and that they find a special place in your home during the incredible years ahead.